One of the general struggles people have with technology is how to come up with and remember passwords for all the many accounts they have online. We’ve all be told not to use anything obvious, anything connected to our lives that other people might know (the name of a pet for example). When creating a password for an online site there are often rules like you need to include at least one capital letter and a number. Sometimes you need to include a non alphanumeric symbol and sometimes you cannot use one. Sometimes the password must be at least 8 characters long, sometimes at least 14 characters long, sometimes exactly 6 characters long. So any system you come up with is always going to end up falling outside some set of rules somewhere, sometime. vault. But which password vault? And will it work across all my devices? I tried Dashlane but it was cumbersome on my phone and I gave up. I just came across an article on the move to get away from the password Passwords Are Terrible — And These Companies Want To Kill Them which is interesting although still feels far away from now. 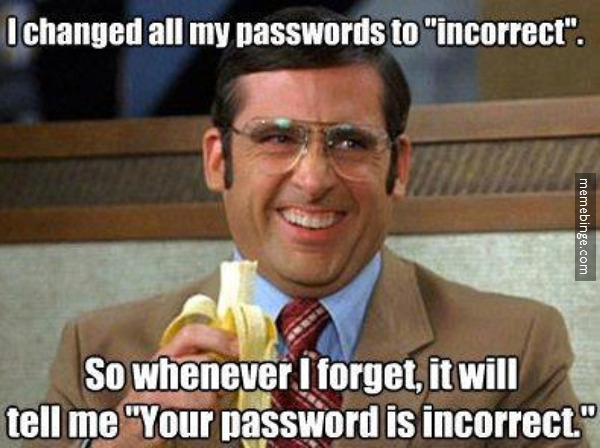 What do you do about passwords? How do you handle passwords when using accounts with students? Here is another interesting article on Four Methods to Create a Secure Password You’ll Actually Remember. From Home Room, the official blog of the US Department of Education, comes a post on social media tips for educators. Dorothy Amatucci, a digital engagement strategist at the U.S. Department of Education, writes that Home Room is developing four tip sheets on topics that include comprehensive information on digital engagement tools and practices that are useful for education. The first tip sheet, released last week, focuses on innovative engagement. This first tip sheet looks at ways state education agencies (SEAs) and local education agencies (LEAs) are using tools like Twitter, Facebook, Pinterest and blogs to share information with teachers and students. While aimed more at P-12, there are some interesting ideas that could be used in adult education including Ed Chats on Twitter and using Pinterest boards for lesson ideas. I get so irritated by the digital native/digital immigrant dichotomy–especially when the dichotomy is associated purely with the year one was born. There are times when talking about large groups and generations in broad terms is useful, but in this particular case I find the concepts used more as an excuse for using or not using technology on a small group level, and that is not so helpful. The image below is a particularly egregious example of the common definition of the two separate worlds of the digital immigrant and digital native. 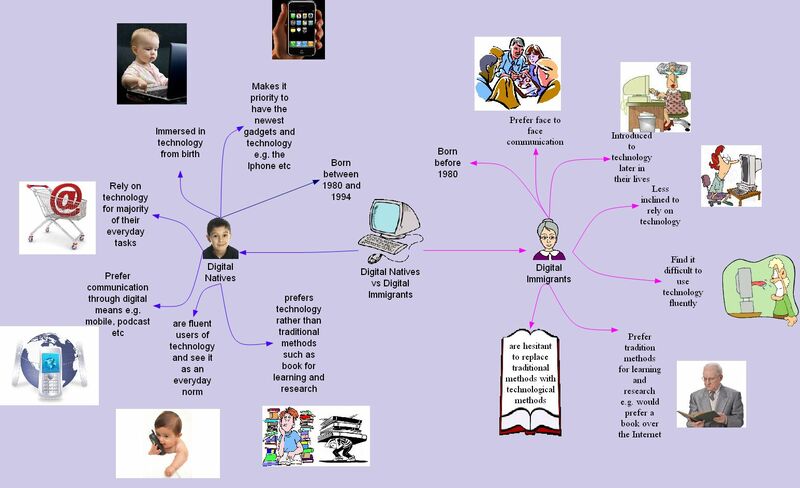 Of course the central image for the digital immigrant is a cartoon of a grandmother and a young boy for digital native; nothing in between. Ironically I found this image on a blog post that includes the following statement “I personally believe I am a digital immigrant but according to the age brackets for digital native I have fallen in that bracket which I am surprised by as I am quite technological illiterate although I am improving with the help of this subject. I hope to become more technologically fluent as I use technology more.” This is part of the danger of this dichotomy, that people apply the terms even when they don’t feel true to their own experience. Rather than a dichotomy, I prefer to think of people being on a continuum regarding their interaction with technology and I see technology as a set of tools. A person’s location on the continuum is determined by their experiences in life and the technology tools they come into contact with and find use for. Think of a technology tool you use now and what led you to adopt it. How did that happen? Was it based on your age or on access and what your friends/colleagues were doing? I like what Douglas Adams had to say in his essay “How to Stop Worrying and Learn to Love the Internet”. I always like Douglas Adams had to say. Admittedly I’m glossing over his use of “invented” and instead choosing to interpret his meaning to be when one first experienced things. Where are you on the continuum? Why? For tweeting, sharing links in presentations, of Facebook and emails, being able to shorten URL’s is a very handy ability. Long URL’s take up space and often get broken when shared. There are a number of online tools to shorten URL’s and some websites (WordPress, New York Times, Huffington Post) and twitter platforms (Tweetdeck) automatically do this for you, but I want to talk a little bit about my favorite tool for shortening URL’s– Bitly.com. You can shorten URL’s using Bitly without creating Bitly account. You copy the URL you want to shorten then go to Bitly.com, paste the URL in the box provided, click “shorten,” and your shortened link will be displayed for you to copy and use wherever you need to use it. You can also customize the shortened link to make it say something about what it is a link to. For instance if I’m posting a link to a lesson on the ProLiteracy website called “I’m a banana,” I will paste the URL http://www.proliteracyednet.org/articles.asp?mcid=2&cid=23&rid=102 into Bitly and it will create shortened link that looks like http://bit.ly/nG1Rj0 . But then I can customize it to look like http://bit.ly/ProLitBanana which is easy to remember and also lets the reader know what the link is to. 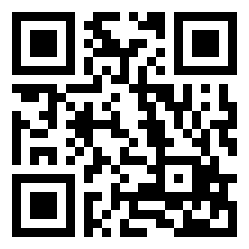 You can also easily make QR (Quick response) codes from your Bitly links. If I take the http://bit.ly/ProLitBanana link and add a .qr at the end so it now looks like http://bit.ly/ProLitBanana.qr, the link is now to the QR code for that link. The QR code can make the link even easier to share in a PowerPoint for example where the audience members could use their cell phone QR readers to get straight to the site on their cell phones. Click on the Info+ link and watch clicks stats and more in real time. Tweet right from the Sidebar without leaving the page you’re on (must be signed in with a linked Twitter account). Keep checking back on the Sidebar to see updated Click stats, and stats for all clicks to the same long link. See in real time who else is talking about this page on Twitter, FriendFeed and blog comments. Everything above you can do without signing in to a Bitly account, but there is one particular tool that you can only access if you do create and sign into an account, and that is the ability to see personalized stats for your Bitly links. Most of my Bitly links get 3 to 15 clicks, but one of my links got over 2000 clicks and I would never have know n that without Bitly. When logged into your account on Bitly you can also see all the links you’ve shortened so it acts like a bookmarker too. I’ve been talking about twitter, facebook, and blogging for adult education for a while now and on this blog I’m going to post all the information and links I have gathered.